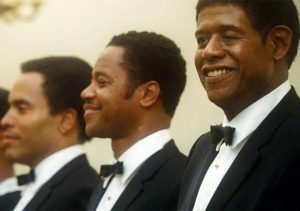 I am very behind the times and I am sure that most of you have seen Lee Daniels’ The Butler – probably, you even saw it when it came out in 2013. I didn’t watch it until recently and it makes me said that I didn’t see it in the theater. Incredible . star-studded, ensemble cast, great story line and one of the best movies that I have seen in a long time. 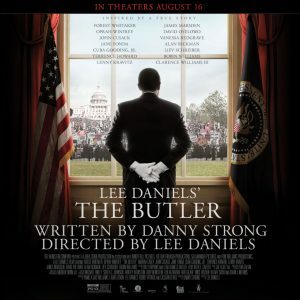 The Butler is based loosely on the real life person of Eugene Allen who was a butler at the White House for 34 years. His film version, Cecil Gaines, works at the White House through eight presidents – from Eisenhower to Reagan. The story focuses not as much on his job though as it does on how the job and the times reflect and run through his family. Storytelling at its best. As soon as The butler ended, the first thought that I had was that it was like Forrest Gump only good. 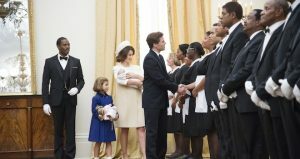 In the way that Forrest Gump told a story where an average person finds themselves wrapped up in pop culture, The Butler tells the story of a family and weaves them into the story of the culture of the times they lived in. We meet most of the presidents that Gaines works for. We meet Martin Luter King Jr. We get to be there for the roll out of the Black Panther Party. We get to see people protesting apartheid in South Africa. And each of these slices of history reflects an African American family that lives and works and breathes the city of Washington DC. They are involved because they should be involved. Cecil’s sons, Louis and Charlie, become the extension of the African American experience during the civil rights movement – finding themselves not only on the frontlines of civil rights but also on the front lines in Viet Nam. The compassion and the ease with which the writers tie all of these pieces together make it seem plausible and not out of the ordinary. Freddie Fallows: Are you political, Mr. Gaines? Freddie Fallows: Good. We have no tolerance for politics at the White House. Besides the writing, the cast is phenomenal. Lee Daniels and the casting agents dug deep. Of course, i am sure after the script started to get floated around they probably had to beat people away with a stick. You get so many great actors in one place in this film. You get Robin Williams as Eisenhower, Alan Rickman as Reagan, James Marsden as Kennedy and Liev Schreiber as Johnson. Along with the president’s you get all the president’s men as well. I could watch Terrance Howard, Cuba Jr and Lenny Kravitz all day long. They each bring their own touches to these roles and make the characters real. Add Oprah Winfrey and Forest Whitaker in as the two starring roles and you have an acting class of sorts being given at every turn. As you will learn, as you move through movies that I review for this website, I am an easier cryer. Lee Daniels’ The Butler had me rolling tears at the very end. This was a great vehicle for this tremendous cast but more importantly, it really seemed to dig into race relations and attempt to tell a real story. The story of a people and how they have been treated. The story of the backbone of the machine that is the White House and how that symbol of America was even off kilter when it came to equality. Everyone needs to watch The Butler. Be mindful of the acting, be mindful of the writing but make sure you don’t miss the point.